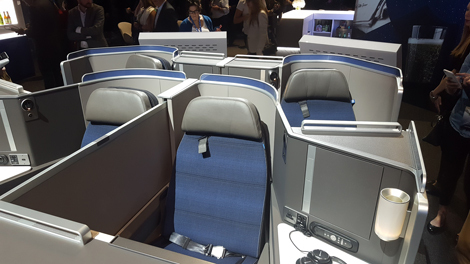 United has unveiled a new long-haul seat called United Polaris (named after the North Star), which will debut on the B777-300ER deliveries at the end of 2016. It will then be progressively rolled out in a retrofit across much of United’s long-haul fleet (not the B757s). At present United has several different configurations and styles of long-haul business class, a legacy partly of its merger with Continental Airlines which saw it adopt some of that airline’s seats. The new B777-300ER deliveries will have ten-across in economy as predicted – see US airlines poised for economy downgrade. The seat has been invented by Acumen which was also responsible for the Etihad Residence and the original First flat bed for British Airways, and designed for United by Priestman Goode. The carrier said it had chosen “to outfit its widebody fleet with a custom-designed, exclusive-to-United seat, rather than select an option already in the marketplace”. Business Traveller is at an event in New York for the unveiling of the new seat, where the image below was taken. The rest of the images in this piece are official pictures supplied by United, and the images in the Flickr slideshow at the bottom of the article are a mixture of official images and those taken at the event. 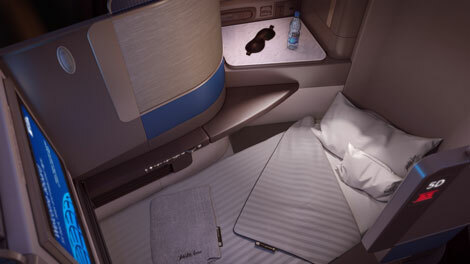 The seat offers direct aisle access for all business class passengers, and features a fully-flat bed, and “up to six foot six inches of bed space”. 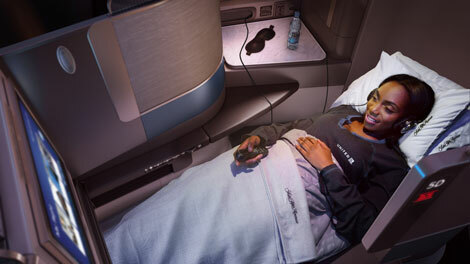 The carrier also said that it had “conducted more than 12,000 hours of research, and sleep emerged as the single most important priority for international business class travellers”. 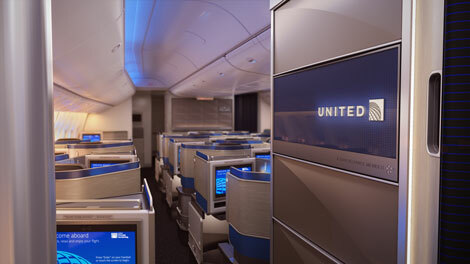 To this end United has chosen custom-designed bedding from Saks Fifth Avenue, with a choice of plush duvets, lightweight day-blankets and a large and small pillow, as well as mattress cushions upon request. United Polaris pyjamas will also be offered on flights over 12 hours, as well as gel-cooled pillows, and a new amenity kits with products from from Soho House & Co.’s Cowshed Spa. “Upon boarding their flight, each United Polaris customer will be welcomed with a pre-departure beverage of his or her choice and gourmet chocolate. While in the air, customers will enjoy regionally influenced in-flight menus updated seasonally, developed in partnership with The Trotter Project and its critically recognized chefs, including Bill Kim of acclaimed Chicago restaurants Urbanbelly, bellyQ and Belly Shack. 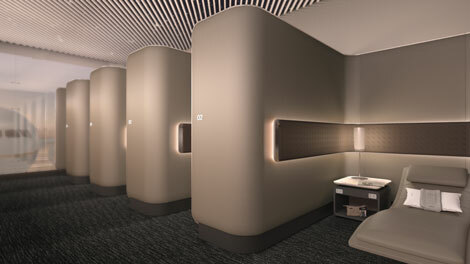 “United will also open an exclusive portfolio of United Polaris business class lounges in nine locations around the world – the only lounge of its kind offered by a U.S. airline to business class customers – that will feature custom-designed chairs, private daybeds, spa-like showers and chef-inspired hot meals served in a boutique restaurant setting so customers can refresh and dine before boarding their planes. Premium sparkling wines and spirits, refreshing snacks and bottled water will also be offered. “With an ongoing boom in passenger air travel and a strong US dollar (the Americas account for 42 percent of revenues, according to Bloomberg data), these should be the best of times for Zodiac. ….However, consolidation among interior suppliers means airlines have fewer options when something goes wrong. In aircraft seating there are a handful of big suppliers left, including B/E Aerospace and Recaro”. Bregier also cast doubt on the pace of Zodiac’s recovery, saying the company remained “in the ditch”.